SUMMARY: Most of the previously reported lumbosacral nerve root avulsions presented with pseudomeningoceles at the time of delayed initial imaging. 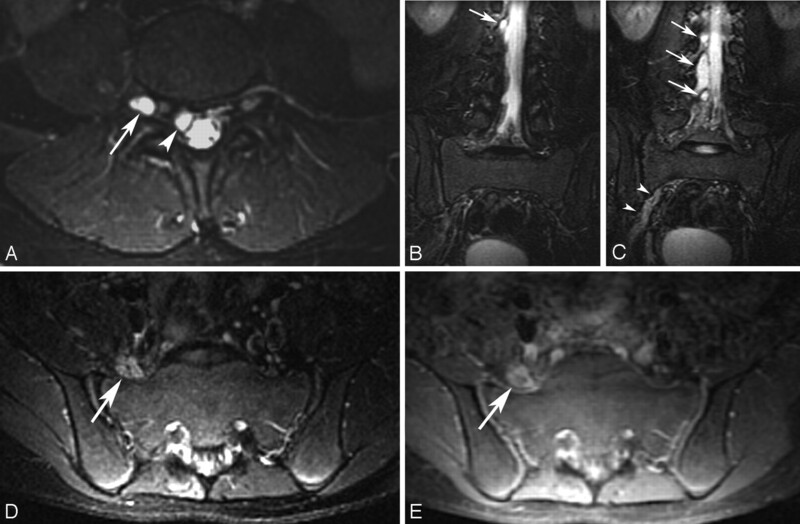 We report a case of traumatic lumbosacral nerve root injury associated with an isolated femur fracture and demonstrate the evolution of pseudomeningoceles following nerve root avulsions and edema in the perineural fat identified on the initial MR imaging. A 16-year-old boy was found unconscious 100 feet from his all-terrain vehicle following a collision with an automobile. On admission to our emergency department, physical examination of the right lower extremity demonstrated a gross deformity of the thigh with significant swelling. Complete neurologic assessment was unobtainable preoperatively because of his altered mental status. Specifically, dorsiflexion of the right toes was not clearly documented. Radiographs showed a transverse fracture of the right femoral shaft without pelvic or spinal fractures. A closed intramedullary nailing of the right femur was performed the night of admission without difficulty. Postoperative physical examination revealed an absence of dorsal and plantar flexion of the right ankle and toes. He had full quadriceps function but weakness of the right hamstrings. There was no sensation below the knee. These findings were suggestive of right-sided nerve injury involving components of L4, L5, and S1. Three MR imaging studies were performed during a 5-week period. Initial studies of the pelvis and lumbar spine were performed 2 days after the injury to exclude iatrogenic complications related to the femoral nailing, such as an expanding hematoma or an entrapment of the sciatic nerve between bone ends, and also to exclude any lumbar spine injury. These studies showed increased signal intensity surrounding the gluteus, the iliopsoas, piriformis, quadriceps femoris, adductor, and hamstring muscles on fat-saturated T2-weighted images, suggestive of hemorrhage and edema (Fig 1A, -B). There was no evidence of right sciatic nerve entrapment. 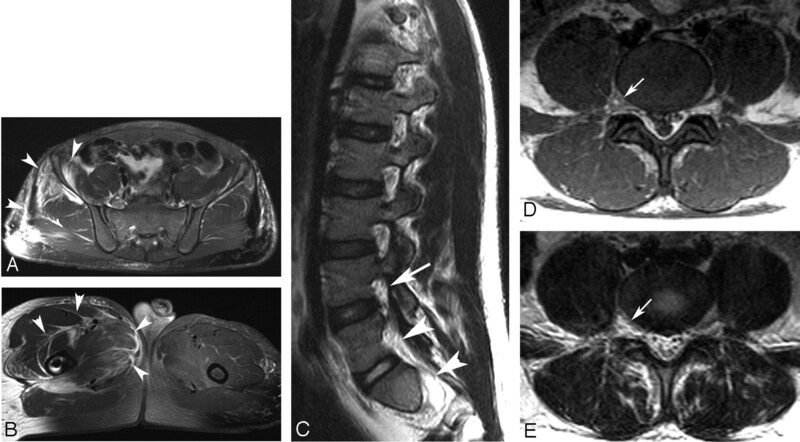 MR imaging of the lumber spine demonstrated no evidence of spinal injury or epidural hematoma. The right L4 nerve root was not clearly visualized in the neural foramen, and there was thinning of the L5 and S1 nerve roots (Fig 1C). Also a subtle loss of normal fat signal intensity was noted around the right L4 and L5 nerve roots on T1-weighted images (Fig 1D), which corresponded to slightly higher signal intensity on T2- weighted images (Fig 1E). These abnormalities were not documented at that time. No pseudomeningoceles were seen. Images were obtained 2 days after the accident. A and B, Axial fat saturated T2-weighted images (TR/TE, 5190/66) of the pelvis (A) and upper thigh (B) show increased signal intensity surrounding the gluteus and iliopsoas (A, arrowheads), quadriceps femoris, and adductor muscles (B, arrowheads). C, Right parasagittal T2-weighted image (TR/TE, 4000/127). The right L4 nerve root is not clearly visualized within the neural foramen (arrow). Note thinning of the right L5 and S1 nerve roots in the neural foramina (arrowheads). D, Axial T1-weighted image (TR/TE, 449/8.9) at the level of L4–5 shows decreased signal intensity of the normal epidural fat surrounding the right-sided L4 nerve root sleeve (arrow). E, Axial T2-weighted image (TR/TE, 5430/110) at the level of L4–5 shows increased signal intensity around the right-sided nerve root sleeve (arrow). Several weeks after surgery, the patient had weakness of the gluteus medius and maximus muscles during rehabilitation, indicating a neurologic injury proximal to the level of the sciatic nerve. One month after the injury, MR imaging of the brain, complete spine, and pelvis was performed, followed by an MR imaging of the lumbosacral plexus 1 week later. Since the first MR imaging, there was interval development of pseudomeningoceles at L2 through L5 nerve root sleeves on the right (Figs 2 and 3A–C). The right L4, L5, and S1 nerve roots were not visualized in the neural foramina; this absence indicated nerve root avulsions at these levels (Fig 2A). Also enlargements of the right sciatic nerve and lumbosacral plexus with increased signal intensity were seen on fat-saturated T2-weighted images (Fig 3D), and diffuse enhancement was demonstrated after the administration of gadolinium (Fig 3E). The brain, spinal cord, and left lumbosacral nerve roots were all normal. No surgical treatment was attempted for the root avulsion. The patient had nonfunctioning gluteus medius, gluteus maximus, and tibialis anterior muscles on the right at 8 months after the injury. He could walk unassisted with an ankle-foot orthosis and had no pain in the limb. Images were obtained 1 month after the accident. A, Right parasagittal T2-weighted image (TR/TE, 4000/180). The right L4, L5, and S1 nerve roots are not visualized within the neural foramen (arrows). B, Axial T2-weighted image (TR/TE, 5430/110) at the level of L4–5 shows interval development of pseudomeningoceles on the right L4 (arrow) and L5 (arrowhead). Images were obtained 5 weeks after the accident. A, Axial fat-saturated T2-weighted image (TR/TE, 5430/110) at the level of L4–5 shows pseudomeningoceles clearly on the right L4 (arrow) and L5 (arrowhead) nerve root sleeves, which contain no nerve root. B and C, Coronal short-inversion-time inversion recovery images (TR/TE/TI, 6000/44/150) show the enlarged nerve root sleeves at the L2 (B, arrow) through L5 levels (C, arrows). Note increased signal intensity of the right sciatic nerve (C, arrowheads). D, Axial fat-saturated T2-weighted image (TR/TE, 5117/55) shows an enlargement and increased signal intensity of the right sciatic nerve (arrow). E, Intravenous gadolinium-enhanced axial fat-saturated T1-weighted image (TR/TE, 616.7/14) shows diffuse enhancement of the right sciatic nerve (arrow). Most previously reported lumbosacral nerve root avulsions were associated with high-energy trauma and lumbosacral or pelvic fractures. A review of the current literature did not identify any report of lumbosacral root avulsions associated with an isolated femur fracture.2,3 In this case, it is likely that traction on the sciatic nerve combined with abnormal torso position at the time of injury resulted in avulsion of the L4, L5, and S1 roots. Historically, myelography with or without subsequent CT scanning has been used to diagnose lumbar nerve root avulsions and document pseudomeningocele formation. More recently, MR imaging has become the standard initial technique because this noninvasive study requires no intrathecal contrast and the entire neural axis can be evaluated on a single study when indicated.3 MR imaging is a better technique for patients sustaining significant trauma because they are able to remain in the supine position during the examination. Most patients with traumatic lumbosacral nerve root avulsions present with pseudomeningoceles at the time of initial imaging.1–3 Pseudomeningocele formation occurs when the nerve root sleeve is stretched and torn. CSF then leaks into the adjacent tissue, and within several days, cellular proliferation may close the tear, leaving a pouch-like extension.4 Pseudomeningoceles are kept patent by transmitted CSF pulsations and result in gradual enlargement.5,6 In patients with a history of trauma, the association of pseudomeningocele and the absence of visible corresponding nerve roots are pathognomonic of a nerve root avulsion injury.2 A pseudomeningocele is usually associated with a nerve root avulsion, but a nerve root avulsion can occur without formation of a pseudomeningocele. Also pseudomeningoceles do not always imply nerve root avulsions. The arachnoid may be torn with varying degrees of a nerve root injury, from a mild stretching to a complete tear.4,7 In our patient, there was a right S1 nerve root avulsion without the formation of a pseudomeningocele at the S1 nerve root sleeve, but there was a formation of pseudomeningoceles at the right L2 and L3 nerve root sleeves, with grossly preserved right L2 and L3 nerve roots (Figs 1C, 2A, 3B, -C). To our knowledge, this is the first report that demonstrates the evolution of pseudomeningoceles corresponding to nerve root avulsions and edema in the perineural fat identified on the initial MR imaging (Fig 1D, -E). Potter et al10 reported MR imaging of sciatic nerve injuries in acute acetabular fractures. MR images of the sciatic nerve obtained after injection of gadolinium demonstrated intraneural or perineural enhancement in all patients with either changes in baseline somatosensory-evoked potentials or preoperative neurologic deficit; however, the preoperative enhancement pattern alone could not be used to predict a neurologic deficit. Potter et al concluded that MR imaging could be used to detect subclinical injury of the sciatic nerve. Nguyen et al11 reported that gadolinium enhancement in spinal nerve roots occurred with chronic compression in experimental animal models. They documented histologic evidence of nerve root degeneration, vascular engorgement, and disruption of the capillary endothelium basement membrane, and these changes may increase vascular permeability of gadolinium. The gadolinium enhancement and increased T2 signal intensity of the sciatic nerve and lumbosacral plexus elements seen in this case were considered to be MR imaging features of a peripheral nerve injury. Most nerve root avulsions have been diagnosed only after pseudomeningocele formation, and MR imaging is rarely performed immediately after injury, very likely because of multiple factors, including difficulty in obtaining an accurate neurologic assessment in patients with multiple fractures, the presence of head injuries, and the relative rarity of this injury. Another factor that leads to a delay in diagnosis is the difficulty in detecting nerve root avulsion on routine MR imaging when there are no associated pseudomeningoceles. Accepted after revision November 1, 2005.